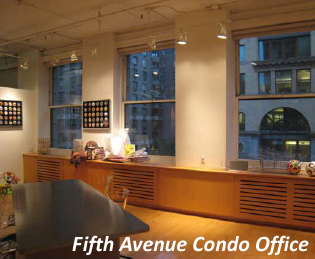 Many organizations are taking advantage of commercial condos, a growing trend in Manhattan commercial real estate. Leasing commercial office property limits your company's liability, but rents can be very expensive. Other than tax write-offs, there are few long-term investment benefits to leasing. Purchasing a commercial condo will build your company's equity and provide excellent long-term investment value as Manhattan commercial real estate values trend upward. Owning your office space will allow your company to have a solid picture of your monthly overhead into the future. You will be immune to rent hikes, making it much easier for you to manage your budget and make projections. Commercial condominiums represent a growing portion of office condos for sale in New York and sellers continue to take steps to attract qualified buyers. Now is an excellent time to buy into the market. Your Prime Manhattan commercial real estate broker is fully prepared to help you make a great decision and purchase a commercial condo that satisfies all of your company's needs while providing excellent investment value. Commercial condo buildings are not that prevalent in New York City. Therefore normal listings are not readily available. Generally there is a limited number of commercial condos offered for sale at a particular time and or location. Call us directly or fill out our Broker Assisted Search form to review all available condos on market.